Microscopic Gardening: Tiny Blossoms of Silicon by Vivek Garg has been voted the Australian National Fabrication Facility- Victoria Node (ANFF-VIC) Image of the Year 2018 by Melbourne Centre for Nano-fabrication (MCN). The image shows a scanning electron micrograph (false-color) of Silicon (Si) nanoflowers, created using MCN’s Focused Ion Beam (FIB) in conjunction with wet chemical etching. Vivek and his colleagues are investigating fabrication of 3D freeform structures of Si, such as these nanoflowers, due to their unique optical properties. Such structures can be engineered for multicolor generation through selective absorption of light and have tremendous potential for future optics offering unique opportunities for optical security, polarimetry, spectral imaging applications etc. 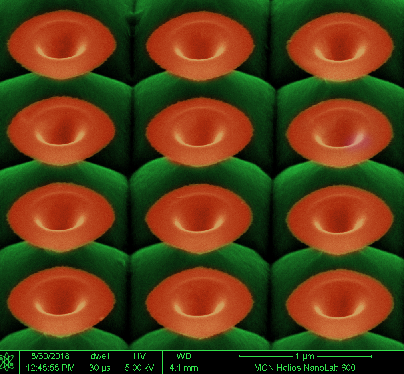 “The bulk structuration of Si substrate, based on the ion implantation design and area, allows fabrication of exotic functional and 3D micro/nanostructures on Si substrate exhibiting unique optical properties for applications in nanophotonics and physical sciences,” Vivek explained. Vivek is a PhD candidate with the IITB-Monash Research Academy, a collaboration between IIT Bombay, India and Monash University, Australia and recipient of Tata Consultancy Services (TCS) Research Scholarship. He is working with Dr. Rakesh Mote, Department of Mechanical Engineering, IIT Bombay, India and Dr. Jing Fu, Department of Mechanical and Aerospace Engineering, Monash University, Australia on fabrication and controlled manipulation of freeform 3D micro/nanostructures with ion beams. This work is a part of his thesis project FIB nanofabrication and its application in creating novel nanostructures for diverse applications such as anti-reflection, color filters, sensors etc. to name a few. As winner of the competition, Vivek will take home a $200 prize. 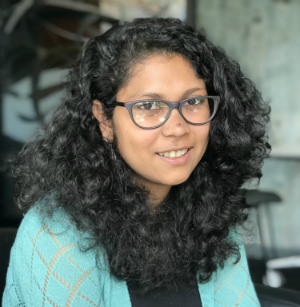 We are proud to announce that Antara Dasgupta, our PhD scholar’s popular science story has been selected in the “Top 100” in the DST AWSAR science communication competition. Sapna had to choose. Her father was a priest at the popular shrine Kedarnath. The family never saw him after June 15th, 2013. The fateful day when nature decided to raze all signs of human presence from the flood plains of the mighty Mandakini. Over 8,000 cubic meters of water gushed across the valley in about 3 seconds, erasing all signs of an anthropogenic past. His body was never found. Donations from patrons kept the family afloat for a while. The laughable government compensation did little to help their predicament. Especially as her father was missing not dead, compensation was provided accordingly. Scientists agree that the impacts of the “Himalayan Tsunami” of 2013, were intensified by unbridled and unplanned development in the river flood plains. The scale of the tragedy was apparently exacerbated by a monumental failure of inter-agency communication. Warnings were left unheeded, rising water levels in the glacial lake upstream went unreported. State officials delayed taking any action as the “pilgrim season” was underway and closing the gates to the shrine would cost them the precious spoils of tourism. I for one, have never been able come to terms with the fact that most of the deaths from this catastrophe were preventable. It was then that I decided to specialise in hydrometeorological disasters like flooding, determined to work towards more reliable early warning systems. In pursuit of this arduous but rewarding goal, I was recently able to develop a new semi-automatic flood-mapping algorithm with others from the IITB‑Monash Research Academy, which promises significant improvements in accuracy over existing techniques. The algorithm explicitly utilises patterns of the radar backscatter, which are observed in the image, in addition to the recorded backscatter itself. Specific arrangements of backscatter values in the image are first identified and then optimised by using advanced mathematical techniques to amplify the information content that is used in flood identification. Finally, a fuzzy machine learning algorithm is used to classify the image into flooded and non-flooded areas, which also expresses the level of confidence in the flood mapping at each pixel. Validating flood maps that are generated by using this technique against aerial photographs demonstrated an improvement of almost 54 % in some areas over traditional methods. These results are encouraging as the validation zone also included a notable portion of urban and agricultural land-use. Urban landforms are, perhaps, the most challenging in radar-based flood detection and, arguably, the most crucial from a flood management perspective. While radar images are widely accepted as the most reliable resource for flood monitoring given their ability to penetrate cloud cover; they are notoriously difficult to interpret and are affected by a variety of uncertainties. Urban and vegetated landscapes, which present an inherently large number of potential scatterers to the radar beam, often result in complex images. Therefore, to arrive at any practicable intelligence, radar-based flood maps generated using automated methods often require post-processing by experts, trained in the physical principles of radar backscattering mechanisms. Automatic image processing chains have recommended the use of supporting datasets such as distance or height above the closest river channels, and land-use and cover information to enhance the accuracy of flood mapping. However, in developing countries where such ancillary information is seldom available with reasonable accuracy, this approach could potentially revolutionize rescue and response operations. While disaster preparedness has evidently improved, given that the number of fatalities caused by floods of similar magnitudes has declined over the years, what has been accomplished is not nearly enough to cope with the increasing intensity and frequency of weather-related disasters under a rapidly changing climate. This is evident especially in cascading disasters such as flooding, when the rainfall event often leads to landslides, cutting off transport access and communication in the affected areas. If the downstream consequences such as waterborne diseases and the mental trauma suffered by flood-affected communities are also considered, floods can be viewed as the single most devastating natural disaster worldwide. During the initial rescue and response operations, localised information on the whereabouts of flooding is critical in the ensuring of effective regional prioritisation and efficient resource allocation. However, one can intuitively imagine that travelling into flood-affected areas to gather such information during the event is far from safe. Satellite imagery is an attractive and cost-effective alternative to observing the inundated area synoptically. This can facilitate the planning of evacuation strategies and optimise the often limited resources that are available. For example, during the 2013 Himalayan floods, a rescue chopper with 12 Indian Air Force officials crashed, killing all on-board, delaying operations and compounding the magnitude of the disaster. The Himalayas, as well as other flood affected regions, are not easy to navigate without accurate localized information. We hope that by improving the accuracy of single-image flood mapping, we can contribute at least slightly to the safety of rescue workers. This research constitutes the first part of my PhD project titled, ‘Towards a Comprehensive Data Assimilation Framework for Operational Hydrodynamic Flood Forecasting’. My research strives to integrate all the seemingly disparate sources of flood information presently available, such as satellite and crowd-sourced data, to arrive at more accurate and timely flood forecasts. I am undertaking this research at the IITB‑Monash Research Academy, which is a collaboration of IIT Bombay, India and Monash University, Australia, established to strengthen their bilateral scientific relationship. My research team includes A/Prof. RAAJ Ramsankaran from IIT Bombay; and Prof. Jeffrey Walker, Dr Stefania Grimaldi, and A/Prof. Valentijn Pauwels from Monash University. I hope that the model-data integration proposed in this study leads to the development of more reliable flood early warning systems which can allow timely evacuation. Never again should someone like Sapna, have to deal with the disappearance of family members due to a flood and abruptly be thrown into dire straits with only false hopes to look forward to. This article is based on a paper that was published earlier this year: ‘Towards operational SAR-based flood mapping using neuro-fuzzy texture-based approaches’. It was published in Remote Sensing of Environment, which is a highly reputed journal in the field of remote sensing. This story was written by Antara Dasgupta, and it comprises original, unpublished content. We are delighted to announce that, Prof. Murali Sastry, our CEO, is the recipient of the 50 Education Innovative Leaders award, as a thought leader in Healthcare Industry and a contributor of value. This award has been declared by the Worl Innovation Congress. The World Innovation Congress is a not for profit body that attempts to organise the annual meet with the objective of Learning & Development, Networking & Recognizing Leaders who have contributed value to the profession or their organization and make a difference. Such value contributors are influencers who have influenced positively. Nina E. Woodard, President & Chief “N” Sights Officer , Nina E. Woodard & Associates, a division of NDPendence, Inc. The Juries & Research cell have carefully worked towards architecting the program in recognition of the talent that rightly deserves to be recognized, our approach is towards thought leadership. The “50 Education Innovative Leaders ” is a reflection of the winner’s professional achievement & a belief that they are thought leaders in Healthcare Industry & a contributor of value. Description: Speaker will share his journey as a trained researcher. Topic will be of general importance, all branches of student most welcome to attend. Objective: To provide students with a concise report on his recent book on A&N. The Andaman and Nicobar Islands constitute an unique system in the Indian context that is also one of the least understood. The islands have no parallels on multiple grounds – geological, ecological and socio-cultural – and put together these form a unit that is complex and needs special attention and care. The islands are extremely rich from an ecological point of view – rich tropical forests, a diverse coastline comprising beaches, rocky coasts and mangroves and oceans that are thriving with coral reefs and marine life. The islands are home at the same time to a number of indigenous communities who have been here for thousands of years but are today among the most marginalised and vulnerable. And very importantly, the islands are located in Seismic Zone V, the most seismically active zone on the planet. Earthquakes here are a regular occurrence and the 9.3 richter scale earthquake that caused the giant tsunami of December 2004 had its epicenter not very far from the Nicobar islands. The presentation will dwell on these three distinctly different but complexly inter-related aspects of these islands to argue for a larger and a more holistic understanding of the place. It will present a range of examples of how recent developmental interventions in the islands – for infrastructure development, defence installations and tourism promotion – are wilfully ignoring the dynamic and sensitive social, ecological and geological realities of this remote island chain and increasing manifold the vulnerability of the islands and its human and non-human residents. Pankaj Sekhsaria’s research interests lie at the intersection of environment, science, technology and society. He has worked extensively in the A&N islands and is the author/editor of four books on various issues of the islands. 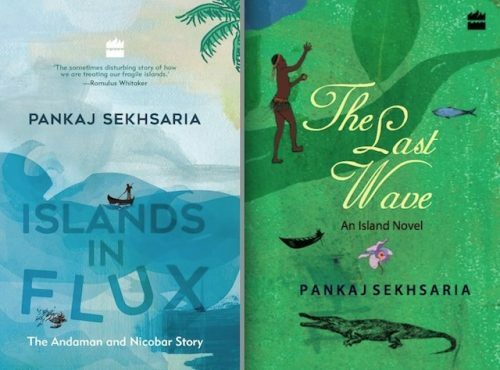 These include ‘Islands in Flux – the Andaman and Nicobar Story’ (Harper Litmus 2017) and ‘The Last Wave’ (HarperCollins India 2014) his debut novel that is a deeply ecological story based in the Andamans. He is currently Associate Professor, Centre for Technology Alternatives for Rural Areas (C-TARA), IIT Bombay, and also a long time member of the environmental action group, Kalpavriksh. He has a PhD in Science and Technology Studies (STS) from the Maastricht University, Netherlands and his latest book based on his doctoral research is ‘Instrumental Lives – an intimate biography of an Indian laboratory (Routledge, 2019). 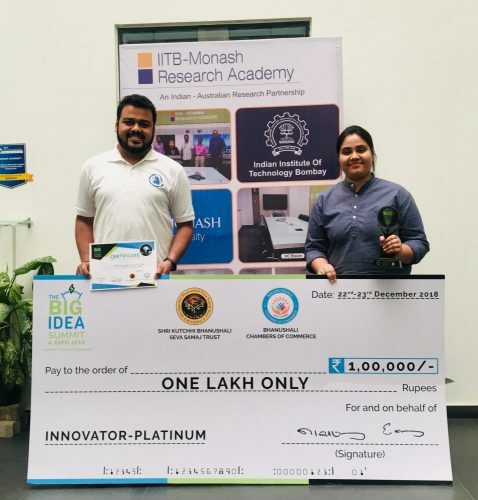 Team PHABiO (by our two PhD students, Nikhil Jain and Sukanya Dikshit) won the Platinum Innovator Award & Rs 1 lakh cash prize as they stood at 1st Position in The Big Idea Summit 2018, among Top 64 innovations selected from 265+ innovations submitted from all over the nation, for the Summit www.phabio.in On 22nd and 23rd December 2018, The Big Idea Summit(http://www.thebigidea.in/) was held by Bhanushali Chamber of Commerce (partnered with many Govt and Academic Institutions like Tata Centre & Corporations) where more than 265 Innovations were submitted nationally. PHABiO (PHA as a healthy plastic) was selected in top 64 Innovations for the summit. From top 64 selected innovations, only 6 Innovations reached into finals for pitching to investors and corporates. From the 6 finalists- PHABiO was awarded as Platinum Innovator (1st Prize) with Cash Prize of INR 1Lakh, a Memento & a certificate along with talks with Investors for seed investment and guidance on Patents, Company Registration, Business Formation etc. 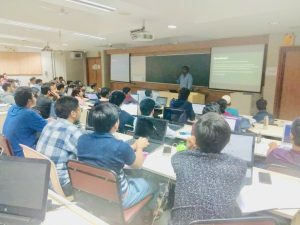 Diptesh Kanojia gave a talk in the “Open Data Science” Workshop at Techfest, IIT Bombay on 15th December. He spoke about Natural Language Processing, Data Science and how they are related to each other. While presenting the different facets of the NLP research done at his lab, he connected it to how a data scientist can use the research to solve a relatable real-world issue. He discussed the NLP research areas of Machine Translation, Sentiment Analysis, Sarcasm Detection, Speech Processing, Cognitive NLP and then went into details of Computational Phylogenetics and Cognate Detection, the latter two being a part of his Ph.D. Thesis. He also presented some excerpts of his work from a recent publication at CODS-COMAD 2019 and explained how Cognate detection is an important problem in the area of Historical and Cultural Linguistics.The talk was well received as the feedback from the students and some entrepreneurs were positive. Later, it transcended more into an interactive session on what tools can an amateur use to start NLP and what online courses can one pursue to deal with these NLP problems. Pranali Deore won a first prize in Young Rapid Research (YRP) presentation award at an International conference, Biotechnological Research and Innovation for Sustainable Development (BioSD 2018), held in Hyderabad on 23-25th Nov 2018. The nature of the prize is a certificate and 200 euro coupon from SringerNature to avail educational books. The IITB-Monash Research Academy is a unique academic collaboration between Monash University and the Indian Institute of Technology Bombay (IITB). Recognising India’s status as an emerging research and global technological powerhouse, the IITB-Monash Research Academy was opened in 2008. Since then, the Academy has launched 420 joint collaborative projects, recruited 250 students and attracted $14 million in funds committed by industry partners including CISCO, Orica, InfoSys, TATA, Reliance, SABIC and BHPBilliton. Sreejata Paul is one of the IITB-Monash Research Academy’s inaugural Faculty of Arts intakes into the project, Gender and Public Sphere. Under the Academy’s flagship joint-PhD program, Sreejata is supervised in Australia by Dr Mridula Nath Chakraborty, Deputy Director of the Monash Asia Institute, and in India by Dr Paulomi Chakraborty from the Department of Humanities and Social Sciences at IITB. Sreejata’s unearthing of previously undiscovered Bengali Muslim women’s writing during the Indian colonial period is an exciting contribution to the field of women’s education, global feminist concerns and examinations of the public and the private. “Sreejata’s work is a wonderful way to bring to life different feminist voices, cutting across time and culture,” Dr Chakraborty said. Sreejata describes her research as bringing to life the experiences of Bengali Muslim women who at this point in history were contained within the home and committed to domesticity, marriage and child-rearing. Their voices were rarely heard in the public sphere. Despite the confines of their day-to-day lives, these women were in fact making forays into creating and publishing literature that voiced their frustrations, hopes and ambitions and imagined a life for themselves outside the home. They were also creating revolutionary commentary into the ways in which their religion limited their potential. “One of my goals with this research is to bring to life literary role models that modern women can use. I want to hold up these women from the past who were clearly envisioning the type of future they believed was possible,” Sreejata said. 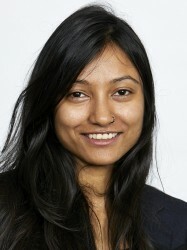 Working across disciplines in a joint PhD program has deepened Sreejata’s links to the Indian and Australian academic communities, and created unique opportunities to collaborate and learn from the world’s leading researchers. “I would never have had the opportunity to do a research project of this kind, in this depth, outside of this program,” Sreejata said. “The academic community here at Monash is cooperative, co-creative and supportive. I can go to other universities and they will put me in touch with people who can have input into my research. I love that about being part of the city of Melbourne’s academic community; people know about each other’s research and they are willing to be help and support one another. Monash Faculty of Arts Dean, Professor Sharon Pickering, said humanities, arts and social sciences had an important role to play in shaping the workforce in a rapidly-changing world. “It’s going to be at the intersection of the human and the technological development that our very best, most critical, most innovative thinking will need to occur. It’s also where we stand most to gain,” Professor Pickering said. 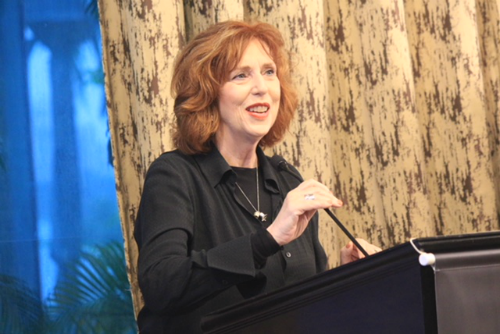 Monash University Vice Chancellor Professor Margaret Gardner described the IITB-Monash partnership as breaking down barriers to global innovation. Day 4: Hands-on training for group 1,2,and 3 (Materials Lab). Professor Margaret Gardner AO, President and Vice-Chancellor of Monash University was a special guest at the recent Institute of Technology-Bombay convocation (graduation) ceremony held on August 11th 2018 in Mumbai, India.The guest of honour for the convocation ceremony was the Honourable Mr Narendra Modi, Prime Minister of India, who delivered an inspiring speech as well as three gold medals and 43 silver medals to students. Joined by a Monash delegation of senior Monash staff, Professor Gardner witnessed the graduation of 29 PhD students from the IITB-Monash Research Academy joint venture program; five students from the program also received medals from the Prime Minister. 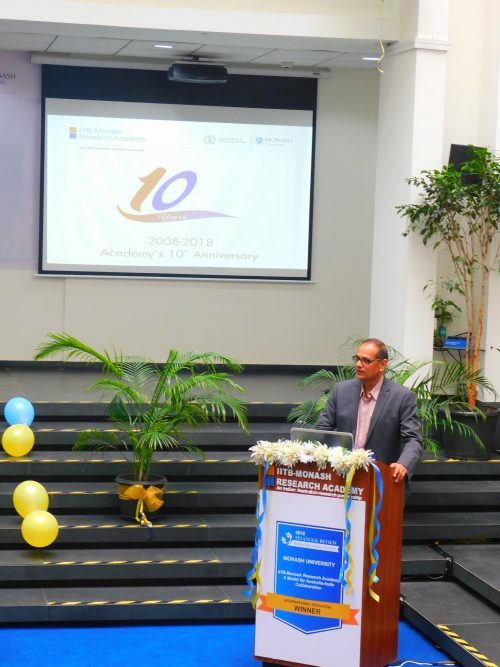 The Research Academy is celebrating its 10th year of operation in 2018 and this was the 6th cohort of students to graduate alongside their IITB peers. Professor Gardner, Deputy Chancellor Shane Buggle and Provost and Senior Vice-President, Professor Marc Parlange formed part of the official academic and VIP procession that sat alongside Prime Minister Modi on the graduation stage as part of the formalities.The IITB-Monash Research Academy joint venture was established in 2008 in recognition of India’s status as an emerging research and global technological powerhouse. It is a collaboration between the Indian Institute of Technology Bombay (IITB) and Monash University. The IITB-Monash Research Academy enables the formation of multi-disciplinary research teams across Australia and India, challenging the traditional individual/discipline-oriented research agenda. The Academy also enables the long-term engagement of industry commitments structured around major research challenges. The Academy has successfully fostered deeper collaboration across the higher education sector. It has recruited 250 students, launched 420 joint collaborative projects and produced 600 research publications and Industry funded projects to the tune of $14M in committed contracts. The collaboration has also seen a 585% increase in co-publications from 2012 -2017.After the ceremony the Monash delegation hosted an ‘Alumni and Friends’ reception event in Mumbai. Guests included the newly graduated students, Monash and Academy staff and alumni and friends of Monash drawn from government and industry. “…the challenges we’re prepared to put to ourselves (at Monash) are big challenges and we have the excellent people to take on those challenges,” she concluded. 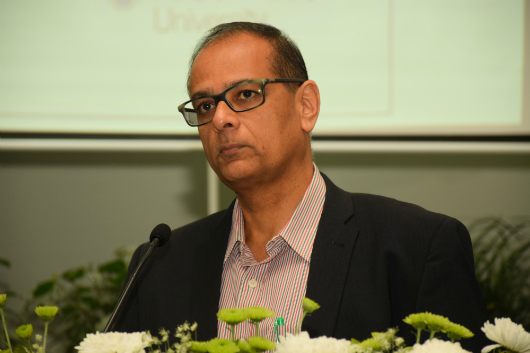 Also speaking at the event was by Dr Murali Sastry, CEO IITB- Monash Research Academy. He joined Professor Gardner is congratulating the new graduates and in highlighting the importance of continued engagement in India. He also encouraged Monash University Alumni to connect with alumni from the Research Academy. 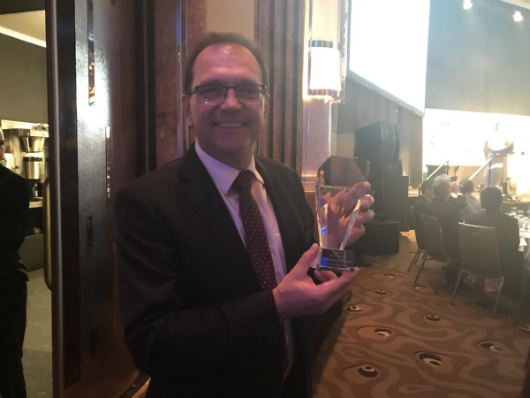 The Academy wins the prestigious Australian Financial Review National Award for International Education 2018. On behalf of the entire IITB-Monash Research Academy, I’d like to congratulate all of the award winners and wish them the very best as they set out on their careers.